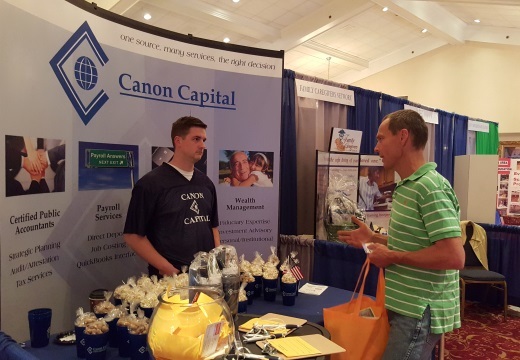 We had a terrific time earlier this week at the Indian Valley Chamber of Commerce 2015 Business Expo. with our Wealth Management Group, talks with an Expo attendee. Vicki Barnes, director of payroll services, and Lori Canfield, office manager, show off our team jerseys. 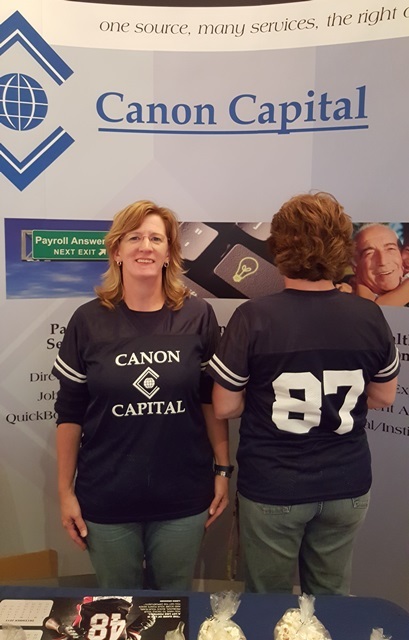 We’re all wearing #87 to represent 1987, the year Canon Capital Management Group was established. “Team Canon Capital” represented this year’s theme “Sporting Success…Join the Winning Team!” sharing peanuts and popcorn along with all of the services we offer to businesses and individuals in our community.